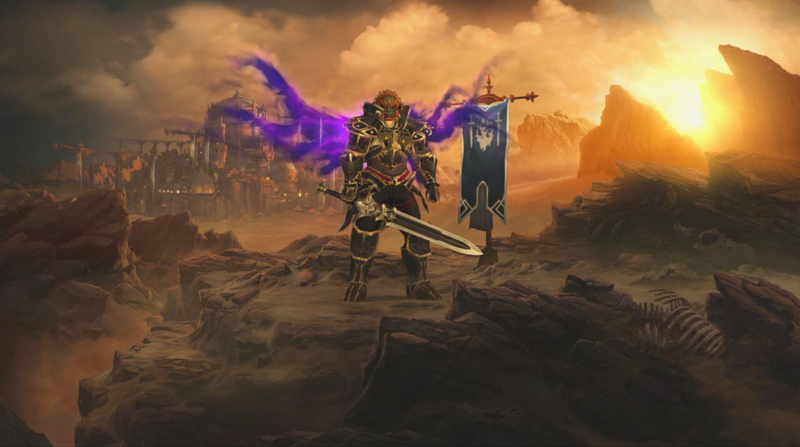 Blizzard was hoping to WoW the world tomorrow with the announcement that Diablo III would be coming to the Nintendo Switch, a reveal that may go down as one of 2018’s worst kept secrets thanks to a long series of rumors and possible teasers that the game would indeed be coming to the platform. Unfortunately Forbes blew the news a bit too quickly, with coverage of the embargoed news briefly going online before quickly being pulled off. As they say, the internet never forgets, and intrepid young sleuths were able to get their hands on the announcement and its details. It looks like the game will be sold as the Eternal Collection, including Reaper of Souls and the Rise of the Necromancer expansion, and will also include a number of Nintendo exclusive cosmetics. Cosmetics include the Ganondorf cosmetic armor set (naturally), tri-force portrait frame, and chicken pet and Echoes of the Mask wings. Diablo III on Switch will also allow up to 4 players on a single system, four players on separate systems wirelessly, and online on Nintendo Switch (launching in September) and will cost $59.99. Forbes’ details were confirmed by Kotaku who also had access to the embargoed news. As Nathan Grayson points out, this is also the first Blizzard game on a Nintendo system in 15 years. Blizzard is reported to have several Diablo projects in the works, with this presumably being one of them. Most assuredly there are more announcements in the works, however your guess is as good as ours on when Blizzard is ready to have them leaked announced.